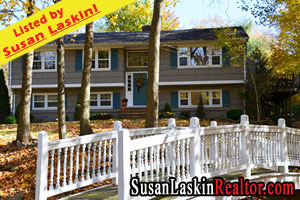 Pascack Valley Real Estate - Expanded River Vale BiLevel! Huge & Expanded home on exquisite and picturesque setting, 26' Victorian Style White Bridge & 2 Full Levels of Living with Extended Family Opportunity! 635 Orangeburgh Rd in River Vale boasts 3 Fireplaces..Upper Level has immense Great Room addition with Cath Ceiling, Sklights and Fireplace..Large Center Island Kitchen with Breakfast Room..Banquet Sized Dining room & more! Click here for more photos & information! Take a Virtual Tour of this home! Browse more Bergen County Real Estate!